Bosch Daredevil, Milwaukee Shockwave, Diablo Power Tool Accessories – Opinions and a Giveaway! ToolGuyd > Power Tools > Power Tool Accessories > Bosch Daredevil, Milwaukee Shockwave, Diablo Power Tool Accessories – Opinions and a Giveaway! As part of our paid partnership with Home Depot, they send over tools and accessories every quarter for review consideration. One of the perks is getting a power tool accessory resupply every now and then, featuring my favorite consumables brands. Sometimes, the brands or styles are new to me, but most of the time, they’re bits and blades that I already use and love. Last quarter, Home Depot sent over a pretty perfect selection of power tool accessories, featuring Bosch Daredevil self-feeding spade bits, Milwaukee Shockwave impact screwdriver bits, and Diablo circular saw blades. Thank you! But here’s the challenge – how do I objectively tell you about power tool accessories that I already like, can recommend, and regularly purchase? Shown below are samples that I received at no cost as part of our paid partnership, but they are also all product lines that I have purchased and will purchase again. Well, just keep in mind that I have pre-existing fondness for all of these power tool accessory lines. Since these are all product lines I’ve purchased and will purchased again, a giveaway seems fair, even necessary. Take this Bosch 19pc Daredevil bit set, for example. I love using these self-feeding spade bits for drilling fast and clean holes. They’re reasonably economically priced, long-lasting, and they deliver good results. I don’t use any other spade bits with a cordless drill anymore. Although they are impact-rated – Bosch describes them as ImpactTough – I only use them with cordless drills. I typically stock up on Daredevil bit sets or promo packs, such as this one, as they’re far more economical than buying bits individually. This set goes from 1/4″ to 1-1/2″. 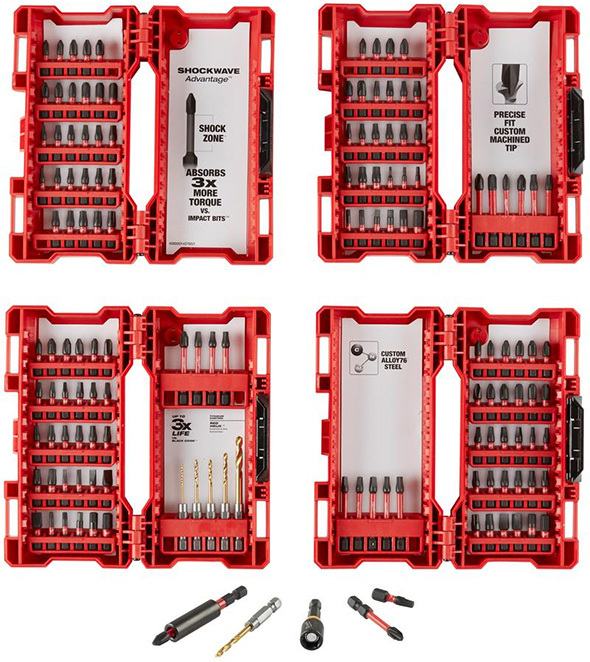 More Milwaukee Shockwave impact screwdriver bit sets? Yes, please! I will take them, and I will use them. These days I buy bulk packs for the bits I use most, a lot of time Milwaukee Shockwave-branded, but I can’t deny the usefulness of larger accessory assortments. I will usually know exactly which accessories I need for a project, and plan accordingly, but there are times when I need a bit that I don’t have immediately available. Or worse – I misplace a bulk bit box. For a new user, assortments like these are great introductions to a product lineup. For existing Milwaukee Shockwave fans, it’s more of a resupply that can complement bulk boxes. I use T20 bits a lot, and so I have a box of them. I occasionally need T25, but most of the time, I don’t need or want to pay for a bulk pack. I’ll go through Phillips and Robertson (Square) #2 bits too, although less frequently than T20, due to my fastener brand preferences. One thing I like is that the cases tell you what’s inside of them, making it easier to sort through a couple of drill bit and screwdriver bit containers of the same size and shape. This set comes with a variety of standard bit styles, including inch and metric hex bits which are rarely found in smaller bit sets and assortments. I have another 80/20 bolt-together project coming up, and it’ll be interesting to see how it goes power-driving the fasteners for once, although I’ll be using a cordless screwdriver and not an impact. A 15-count pack of T25 1″ bits is typically $8, a 5-pack of Phillips #2 power bits is $6, and a 15-count pack of insert bits is $8. Just a set of the inch hex bits is $9. So even if, like me, you look at some of the bits and think “I can’t use that,” assortments can be economical. And, in my experience, they do come in handy for meeting unexpected needs. Thank you Home Depot and Milwaukee, I’ll make good use of these bits. I like Diablo blades, and because of my great experiences with the brand in the past, I trust them without hesitation. I have not used these blades yet, but I have used Diablo Ultra Finish and Demo Demon blades in 7-1/4″ sizing, and now thanks to Home Depot and Diablo, I have 6-1/2″ blades to try out. It’s a good reason to unbox my 6-1/2″ saw. 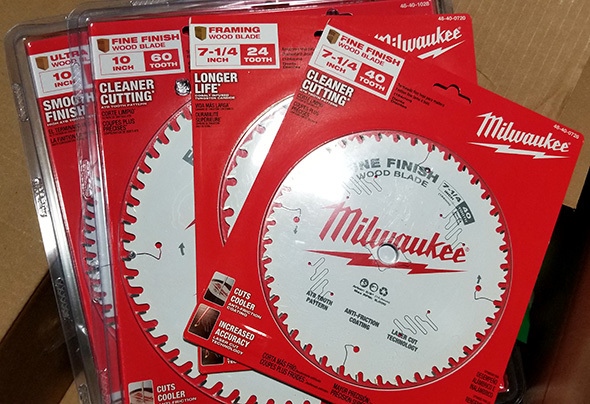 It used to be challenging to find good fine-finish 6-1/2″ circular saw blades, at least in stores. There were plenty of 7-1/4″ saw blades, but very poor selection of 6-1/2″ saw blades. I wish these blades were available back then. Last year, when I was mainly using a 6-1/2″ saw, I received a 7-1/4″ framing blade for testing. With more 7-1/4″ saws requiring testing, I used that Demo Demon blade for cutting 2x4s and 2x6s to size for projects and put my go-to 6-1/2″ saw away. Now, with a 7-1/4″ saw my go-to, I received 6-1/2″ saw blades. But, for what I use circular saws on – mainly quick cuts of 2x4s and 2x6s, and occasional finer cuts in hardwood, composites, and trim, 6-1/2″ saws are more than enough. I love these blade styles in 7-1/4″ sizing, and am happy to see them in 6-1/2″. I honestly don’t recall if I’ve seen these blades in 6-1/2″ sizes before or not, but regardless of that, they’re welcome additions, whether new or just new to me. Alright, so since these are all accessories that I received for free and will definitely use, I feel that a giveaway is in order. Right? To balance things out. The Prize: A $50 Home Depot Gift Card. How to Enter: Leave a comment here and tell is which of these power tool accessory brands or product families you would use the gift card to buy, and why. Winner Selection: 2 winners will be selected at random. Prize Fulfillment: ToolGuyd will buy the 2 winners each a $50 Home Depot gift card. Delivery will be by email or mail. Rules: Entry period ends at 11:59pm ET 2/5/2019. Open to USA residents, and unless there are unforeseen complications, Canadian residents as well. I am in the market for another tablesaw blade, and have had great luck with the Diablos. The price is generally good, and the blade quality has been great. Looking at a new miter saw, so that might be where the blade heads to. How do you control the drilling with the Diablos? I have a set but left them at my last job for them to use as I didn’t like the way they fed and left you with little control. Would love to refresh my saw blades with the Demo Demon! I would definitely go for the Daredevil spade bit set. I currently have a cheap set of 4 spade bits that came as an add on with a multi bit kit that was gifted to me. Would love to see what a really good set of spade bits could do. Thanks for the giveaway! its a massive improvement over the el cheapo spades, but it is nothing compared to an actual tri spiral bit. I would definitely get the Bosch Daredevil spade bits. My current cheapo set tears up the wood really bad. I can’t use them on anything that will show. I’d like to see how nice of a finish these would leave. Would buy more Milwaukee for restoring one of 2 remaining operational WW2 torpedo boats. Come visit PT658 in Portland Oregon. I would probably buy some Diablo blades for my new 7-1/4″ circular saw for some small utility shelving projects and other things I have on my to-do list. Some Shockwave bits wouldn’t be out of the question if I have leftover budget, although I do have some Bosch impact rated bits already. Might need a holesaw too though. I’ve heard good things about those Bosch Daredevil spade bits, would love to try them out. I used these spade bits today. One of my subs has this exact set. I was blown away at how easy a 1″ bit plowed through old 2×4 studs and plates. I’ve already bought this set. Great price to! They are really good spade bits, I’ve been using them for a while. The only ones I like better are the Irwin Speedbore bits, which don’t come in nearly the same amount of sizes. Daredevils are my choice of fast ripping through wood or drywall. I would go for the Daredevil bits, as having a good set of spade bits would be helpful with all the form work myself and my guys are doing. Then again, with as much 3/4 CDX as we go through, the Diablo demo blades would probably last a lot longer than what we have been using. I’d like to try the Bosch spade bit set – as I am currently using a Craftsman spade bit set from the 1950s. It would be great to use a set of quality made bits from this century! I would use it to buy some Diablo/Milwaukee 8.25 blades for my M18 table saw. Have a nice stash of 7.25 & 10 blades but nothing in 8.25. Yeehaw – Canadian Residents too? That’s me! I like those daredevil bits too – just bought a kit last week in fact to get a bigger selection of sizes. Since I don’t need more spade bits at the moment – I would go shopping for those 6 &1/2″ Diablo blades to try in my Dewalt 20v circular saw. I’ve just been using Dewalt-branded blades in it. It would be interesting to see how much of a difference a higher quality blade could make. I just finished an attic renovation and whoever put down the subfloor sank the nails too deep and I ruined my 7 1/4 Circe blades. Will use gift card for saw blades and 2 inch shock driver bits. Just bought Dewalt’s Flexvolt Circ saw and recip saw, so would be a great time to try Diablo’s blades since Ive seen and heard they are amazing. Might try out the daredevil bits too. Bought them once, but didnt like how they cut with a impact. Being you have had luck and like them, id give them another shot, and use my drill instead. All these to help finish up my garage (run all new wiring and build work bench, add a new man door and replace the windows). I would like a set of long shockwave bits, as well as daredevil or milwaukee hackzall blades. I purchase a lot of power tool accessories during Black Friday sales and as I am working on specific projects (I own DW drill bits/bit tips), MKE sawzall blades and hodgepodge of circular saw blades, I love the Bosch DareDevil bits (whatever happened to the Bosch pathfinder bits from the early 00’s?). I would love to put a Diablo blade on Miter saw and finally tryout Makita gold bits or MKE impact rates bits if I won! Not sure what I would use the money on at this point. My Craftsman miter saw definitely needs a new blade, but I have been thinking that I’ve outgrown the saw itself recently. So I would either decide to buy a new blade and work with the existing imprecise saw, or put it towards a new slider… probably a Bosch. I would pick up some of those Diablo saw blades. I use them on my Miter saw and they leave a really clean cut! I am always in need of a sharp finish blade, so I would definitely be picking up one of those in either 6 1/2 or 7 1/4. I am a big fan of the Milwaukee accessories especially the river bits but I do not tend to buy the kits because I hate the short bits that require a bit holder. I prefer the slightly longer bits that have the divot in the shaft to lock into the quick lock on the drivers. Definitely the Daredevil spades. I only have one size (buy for the project, right? ), but it’s leagues better than others I’ve used. I am a contractor with 22 years experience. Diablo blades are the only blades i buy and use on all of my saws. I recently purchased a 4 pack of the Milwaukee shockwave bits that have the picture on the outside so you know what bits are in them and am very happy with the purchase (142 pieces in total for just under $30, great deal). The bosch daredevil bits are the only ones i am not familiar with but would love to try them out. I’d get the 6.5 in finish blades. Selection has always been a little harder to find, but very useful if you have one of the smaller saws!! I’d go Diablo, need a new 10″ blade for my miter saw. Love the Diablo, I would like to get the shockwave, never had any experience with the Bosch. All seem like great products based on the reviews and the article. These are all great but right now the Bosch Spade bits would be very helpful. I am finishing my basement and will need a good set of spade bits for running electrical and low voltage throughout the basement. I also currently have the shockwave bits and use them constantly and never had any problems with them. I would probably go with a Diablo blade for my circ saw to replace the DeWalt are that came on it. I would buy a replacment Diablo blade for my miter saw. I use diable blades in my Recip and circular saws. Miter saw needs one now. I use Bosch spade bits, love them. They get well used. I bought the exact Milwaukee Bit set you pictured, its a love/hate. The bits are nice, but you need to carry a pair of pliers to get them in and out. Then when you have to use the 1/4″ holder on the smaller bits, you again will fight to get the bit out. I rearranged one case for a usable case with the bits I need. I wish I would not have bought the set at this point, as so much of it is going to sit, get lost, and go to waste. From now forward, I am going to use small Plano boxes to hold the bits, and only buy the bits I need, and that will chuck directly into my impact driver, no more adapters for the short bits. I currently use the Milwaukee bits and they are wonderful. I need to get some replacement Torx bits due to severe use, looking forward to the new line of carbide bits you wrote about earlier. As far as saw blades I currently use Diablo 7 1/4″ 24T and 40T with extreme success. 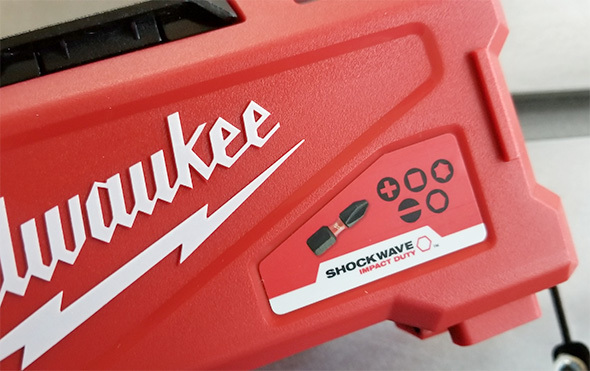 As crazy as it may sound but the Milwaukee Shockwave Impact Screwdriver Bits would be an awesome V-Day present for my wife, given that she loves doing woodworking projects. She tends to “misplace” her bits and comes finds mine. We are also currently working on new soffit, fascia, and drip edge on our house so we could really use a set of the bits and the Diablo Demo Demon blades to make the job go a little quicker. I’d probably go for the Diablo blades since I’m still using the stock blade on my new 7 1/4 circular saw. It cuts ok but from past experience it’ll wear out much faster than the Diablo will. The Shockwave and Daredevil bits are impressive but I’m pretty much set on those for the time being. I myself could use both the Bosch Daredevil Bit Set and the Diablo Ultra Finish and Demo Demon Circular Saw Blades. Would definitely use the gift card towards a Milwaukee product. I’ve been thinking about getting a bigger toolbox (46″) or I another m12 battery for my fuel hammer drill. I’d like to refresh my spade drill bit set with that Bosch set. I’m a fan of Bosch/Diablo consumables and I could always use more! I would totally buy all the bits and the spade drill bits you posted about. I need to upgrade/refresh my stuff. I can use some new saw blades. I would bounce on the Diablo blades. I use them in my circular saw, but have yet to upgrade to any in my table saw. While I’m more than stocked on bits (for now), those Diablo blades look mighty nice. Sold my M18 Fuel 6-1/2 due to a lack of blade choice, though I preferred the cut side on that saw. I might be looking to swap back for that saw with better blade availability. I would have to go with the Diablo blades on this one. I’ve heard great things about Diablo blades, but being relatively new to woodworking, I haven’t been able to justify the cost of buying one. At the moment I don’t own an impact driver, and I already have a set of spade bits, so that would be another good reason to go for the Diablo! I am wanting to purchase Diablo blades for both my miter saw and cordless circular saw. I am especially interested in the 6 1/2″ blades. I am not satisfied with the stock blade currently on my saw. I would use this to continue to restore my family’s future home. It would be much appreciated and used well. I would purchase Milwaukee shockwave bits with the $50 gift card! I purchased the Bosch Daredevil spade bit set during the holidays, but have still been eyeing that Milwaukee shockwave bit set. I also use a ton of TORX bits. I love Milwaukee and their products! Thanks for the chance to win! Diablo table saw blades. Mine is several years old and should be replaced. I would use the gift card to pick up a new 12″ diablo finish blade for the Dewalt Flexvolt miter saw that I picked up over the holidays. I’ve always used their 7 1/4″ and 6 1/2″ blades for my circular saws and the stock blade on my miter saw is almost ready to be replaced. I have been looking at purchasing a couple Diablo products. Web reviews rate them quite well. Honestly, I would also like to try the Shockwave bits when spring arrives . Thanks for the opportunity to enter. Like a few others I could use a new Diablo blade for my table saw. I think my current blade (also a Diablo, 50t) is getting a little worn. I could always use driver bits though. I swear it’s like they all have legs. I’d like to try out Diablo’s 7-1/4″ demo blades. More shockwave bits, I would like to try the new ones they just released. I just built a new pole barn and need to surface mount all the electrical so lots of fasteners will be driven in my near future. I’d definitely get the circular saw blades and spade bits. I have several of the cheapie of the day spade bits that just get twisted up on me whenever I try to use them, and as I use the heck out of my circular saw a fresh blade is always something I could use! I’d use it for the impact bits. I’m constantly looking for the right bit and having them all organized in one place would be helpful. I would buy the Diablo blades since I need it to replace my stock one on my circular saw. I would buy a Diablo 10″ blade for my table saw, something with a higher tooth count. I would buy two Diablo blades. One for the table and one for the miter. Hands down buy diablo blade for circular saw. They are the best of the best and home depot always has them in stock! I think the Milwaukee Shockwave bit sets would make a super gift to give or receive. Since the advent of battery powered impact drivers, regular bits just don’t last or even perform anymore. I would purchase more of the Diablo sawzall and circular saw blades. Simply the best blades I’ve used! Of these I would definitely get Diablo blades. I don’t use the circular saw for much but would get replacement 10″ for the miter and table saws. The Shockwave bits because they work and I am always losing or destroying bits. I would probably buy a new blade for my circular saw. I’m still using the blade it came with and could definitely use an upgrade! I need to upgrade and replenish my bit sets. Just bought a new house, and I find my current assortment of random bits is lacking! I’d likely stock up on Diablo blades, I have many driver bit sets and can’t possibly see me needed more anytime too soon. I recently received a new table saw and am using the stock blade for now but I know I will eventually want the clean cut reliability of a Diablo Blade, and okay I’ll probably buy a snickers bar at the register with the remaining balance. I would use it to buy Diablo 6 1/2 fine finish blades to use in my Makita 36v track saw. I’ve been building cabinets lately and could definitely use more blades. I’d be torn between the Diablo blades or some Bosch router bits. I’d probably go with the router bits since I just stocked up on blades. I have honestly bought all three of those already based on your recommendations. I should probably be saving money for a new floor now! I’d buy the Milwaukee shockwave bit set — they are always solid. Thank you for all that you do and running this giveaway. I already have a Diablo circular saw blade and a Forrest WWII for my tablesaw but I really need to replace my crappy stock Craftsman 10″ sliding miter saw blade. It got me through a bunch of projects, but deflects so bad that it’s almost unusable. Would love to upgrade it to a Diablo one before I get annoyed and give it away. I’d go with Milwaukee organizers and possibly the Bosch daredevil bit set, it’s such a nice-looking complete set. Milwaukee shockwave bits are my favorite but I have enough of them for now and can use another organizer. I’m organizing my shop and the Milwaukee organizers are really great. I also would think about if there’s an upcoming need for the Bosch set, if not, Bosch makes other great things, like oscillating tool blades, and those would be useful, since I have some upcoming uses for them, like recaulking my bathtub. They are great for those small diy jobs where nothing else quite fits. Getting ready to start renovation on a bathroom in an old house with full size timbers and concrete floors, so the Diablo demo blades would be the thing. I have a need to cut some 0.040″ stainless steel sheets to make a removable top on my work bench. I have the steel, reclaimed from an Ikea kitchen island, and I’m perfectly comfortable using my old circular saw, but I don’t want to use a blade not meant for steel, for safety reasons. I’d buy a Diablo Steel Demon blade to tackle this job. I’d report back with the results, of course. I would use them to purchase either Milwaukee or Bosch items for my father to get him something other than DeWalt products that he keeps buying. I was always partial to Milwaukee and Bosch products when I was an electrician. Self feeding bits are nice. Hopefully the Bosch self feeding spades are better than the Milwaukee self feed augers. Daredevil spade bits for sure. I have a cheapo set of spades, and every time I use them the holes are not clean, and I think that I should upgrade, and then I forget, and then the next time I use them, I get frustrated again. I really like the shockwave cases, because I can reconfigure to pack a good selection into one box in my portable kit. Unfortunately, I find they wear out faster than other impact-rated bits I have used. I am in need of a finish blade for my 20v DeWalt cordless circular saw. I love Diablo blades and would certainly use the gift card to buy the 6 1/2 ultra finish blade. I need to replace my table saw and miter blades from stock to Diablo because they’re the best! I would definitely buy some Diablo blades for my new Milwaukee circular saw. Planning on rebuilding my back door deck hand rail. It’s currently not up to code. I already own all of these, so I would have happily used a gift card on any of them. The Bosch Spade bits are great around the property, I buy a holiday set every year or two as they get lost/chipped/etc. I am not building furniture with them, but I love being able to use them in an impact driver so I know my wrists are safe if something unfortunate happens. I bought the giant Milwaukee impact set essentially for the “abnormal” impact bits, mostly the hex bits. The rest of bits are fine and go in the growing pile. The Diablo circular saw blades are fantastic and I generally stock up on whatever is available in the 2 for 1 holiday packs. My grandfather’s 1959 Simpson-Sears circular saw worked perfectly with one of the 6.5″ blades, and I really like the 40 and 60 tooth 7.25″ blades for nice cuts in plywood. The framing blades work well too, I just do not find myself constantly cutting big lumber to length with a circular saw. The Bosch Daredevil bits are shockingly fast and make suprisingly clean cuts. I would never go back to old spade bits. I’d have to go with the Daredevil bits. I have a few spade bits that came in a starter set but they chatter like crazy in anything harder than pine. I also feel like I’m always needing a size that doesn’t come in the smaller sets. Otherwise I would say the Daredevils, I have a set of stubby and standard self-feed and they are major timesavers but you can never have enough, mine are always hiding when I need them most. I am in the market for a rip and crosscut blades for my table saw. Diablo blades are what I have liked using in the past and would spend my money on them. I could really use a good set of spade bits. My old, cheap ones can barely cut any more. With a slew of projects, they would be very handy. I’ve always had to buy boxes of bits. It seems they’re cheaper in price and quality so they wear quickly and I have to change often. I’ve never tried the impact bits and would love to try them. I need new blades for my table saw and chop saw so I would probably use it for that. Diablo table saw blades for sure. A good saw is so much better with a good blade. I am a big fan of the Milwaukee Shockwave Impact Screwdriver Bits I have a few assorted set and the bits hold up well. I am in the market for some spade bits for an upcoming project with a lot of holes to drill. I have looked at the Bosch Daredevil bits and i will buy them. I have heard nothing but good things about them and if the toolguyd approves of them, they are good enough for me. I would use the gift card to stock up on “all the other” types of bits Milwaukee offers. I recently ran into a situation where I had to find a t10 and t15 sized bit. Stocking up on these random bit types now would save a trip to the store for sure! Better to have it and not need it than to need it and not have it . . . .
Impact bits. The set with the most bits that don’t need a secondary attachment the better. I use all three of those brands and really love the prices and the quality of those products. All three brands give you premium accessories that perform extremely well for a fair price. The diablo blades are excellent and the best saw blades on the market in my opinion. I have sets of both shockwave and daredevil bits that I use to make a living and I also have diablo blades on all of my circular and recip saw and I really love the performance of the blades! I need a new miter saw blade and need to get some projects done around the house to make the wife happy so if I get a gift card or extra cash I gonna buy a 10″ 60 tooth diablo miter saw blade to finish the interior trim on my home. Thanks for the reviews and giveaways! Toolguyd is second to none! Diablo saw blades! Moving into a new house soon so plenty of projects in the works. I’ll toss my hat into the ring – new Diablo blades – I’ve had good luck with them. Pretty easy for me…I already own the Milwaukee bits and have plenty of Diablo blades. That leaves the boch drill bits. Those would definitely be helpful as I start planning a custom desk build (need clean holes for routing cables afterall). I own and use the Diablo saw blades in both of my circular saw and table saw, and needless to say I am very happy with them. The Daredevil bits are great too, but I only have 2 sizes(3/4″ and 1″). They can be very aggressive, so I make sure to watch the speed. I would use the gift card to buy a few of the shockwave bit sets. I recently received a new impact driver and I would definitely appreciate some bits to complement it. Love toolguyd, you guys are constantly in my daily routine. Thanks for keeping everyone up to date and thanks for the giveaway opportunity too! I don’t have a large variety of bits yet, so the Milwaukee Shockwave bits would be useful. I also could really use a finer tooth blade for my miter saw, Diablo would be my choice. Would love to get my hands on those dare devil bits. I hear good things! I personally have been using all of these products and lines for many years, they are great. I will continue to purchase them as long as the quality stays the same or gets better. Need a new diablo blade for the circ saw and could always use another assortment of shockwaves. Hard to find the blades for the smaller M12 circ saw so usually have to settle for whatever I can find. I would purchase the Milwaukee bit set as I have recently been purchasing the brand and love it. I lose and break bits routinely and would also purchase the Bosch kit because all of my current ones are incomplete. I would spend that gift card on the bit set and saw blades. I’ve never bought quality bits and this would give me a chance to test better bits. I’m a college student who recently got married. We live in a nice condo but it’s got a few things that need fixing up. I recently bought a new drill but am needing some drill bits! Milwaukee is my favorite brand. I’d also use the gift card towards buying a Milwaukee oscillating multitool and parts! I would buy some more drill bits, such as the Bosch Daredevil spades. Still trying to increase my tools… like always. Diablo, ’cause love those blades! I would buy some shockwave bits to replace my ryobi bits and to use with the M12 drill kit I got on Black Friday. I would use it on some Milwaukee accessories. HD has a nice selection of Milwaukee products. Dewalt guy here who likes Diablo stuff. Gift card would likely support the 20v max router. Spade bit set for sure. While adding on to my house in 2017, I ran speaker wire and Cat6 cable throughout my house. I was struggling to get through 2×4 studs with my crummy spade bit and my electrician, who was working on the electrical wiring at the time, handed me one of the bosch bits… holy cow what a difference. I was seriously thinking that I needed to buy a new drill – nope, just better bits. I could use some Daredevil Spade bits and Diablo blades. Those are both on my Home Depot shopping list already! I would love to get more Milwaukee hand tools to build my starter collection. Definately the diablo saw blades. I use them all the time. Always needing a complete set of spade bits and I’ve used alot of bosch tools so I trust them. And Milwaukee sorry, cause now I’m broke so I’ll catch you my next trip. I just received a new Ridgid drill for christmas and would like to try some of the Bosch Daredevil drill bits for a few projects that I want to do. I currently have all 3 of those products and think they are all fantastic values. Would buy all again if I needed to. I would probably buy a Diablo 12” miter saw blade and replace the stock dewalt one I’ve been using. I love Diablo’s whole line of blades. 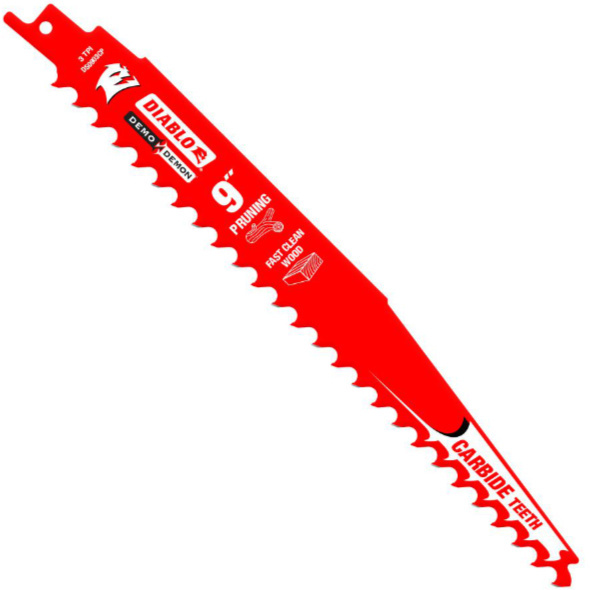 I would buy a new Diablo 12″ fine cut miter saw blade and pick up another Diablo Carbide reciprocating saw blade. I have Diablo blades in all of my circular saws corded and cordless and they cut better than anything I have ever tried. They seem to make the cordless saws last longer with their narrow kerf. I’m a Milwaukee guy through and through, and would love that Shockwave set. I would love to use the Diablo blades on my new DeWalt circular saw I just purchased from you guys. I would also like to get a set of Bosch Daredevils as I don’t currently have any spade bits. My circular saw needs a new blade when I start using it again in a couple months. I’ll definitely be buying Diablo. And I’d love some more Milwaukee accessories. That brand never lets me down! I’d use the gift card towards a cordless circular saw so I could test out these Demon blades. I already use the Milwaukee shockwave impact bits everyday. Definitely would buy the Milwaukee impact bits. I bought some cheapy torx bits from Amazon and I use them all the time to work on my other power tools. I bought a Milwaukee drill/impact driver combo set from home Depot after seeing rave reviews on several sites. Best money I’ve ever spent on power tools. They definitely live up to the hype and I would love to have a matching set of bits. I would be looking to buy a Diablo blades. As I’ve gotten into a little more woodworking and projects this seemed like the blades I would definitely want to try on numerous project ideas! I will buy Diablo blades. They are the best I can find. I would definitely invest in the Milwaukee srewdriver bit set and the Diablo blades. Both are a great value. I would love to get my hands on a 100 dollar gift card to home Depot. To buy MORE Milwaukee EVERYTHING especially a 3/8 stubby impact boot for my tool! I hope I win , what a blessing. Thank you! My new DeWalt DCS570 came with a 24T blade. Sure would like to try that Diablo finishing cut blade and see how much of a difference it makes. Diablo blade fot the mitre saw, definitely time to try a finer cut. I have used both Bosch and Diablo with great results with both. I have not used Shockwave driver bits yet, and if I luck out and get a gift card, I’ll likely get a Shockwave set, to try them out, and use the balance on Diablo saw blades. I love a Diablo blade on my Milwaukee saw. I would certainly love to stock up on those blades. I don’t comment much anymore…..but when I do it’s to say that the Bosch pouch is the only reason I buy their spade bits. Never mind that the self feed and performance are also the best design features. .I want more accessories that come in slim space saving flat fold style soft cases. Self feed sure is a nice feature. It’s perfect for through holes in dense and tough wood, but I even liked using the 16″ version when drilling starter holes into multiple 6×6 landscaping timbers for the 9″ spikes and rebar. The wood was forgiving enough that I could stop the drill from continuing it’s path through, but was really nice not having to apply any downward pressure. Bosch Daredevils and a matching locking extension. Would be a great addition to the few spade bits in my kit as a plumber apprentice. May check out the Milwaukee kit as well… always useful items. Looking to start a new addition and the first order of business will be a bit of demo. So there Diablo blades are highest in my list. The demos I’ve seen are amazing. Bosch spade set to replace my old Dewalt set. Diablo blades are good; as soon as I run out of my Dewalt and Makita spares, I’ll get some. I can always use more Diablo blades…either for my Makita circular saw…my 10″ table saw or my 12″ sliding compound miter saw. And I can always use more Shockwave bits. Probably the only ones I drop or lose before I destroy. I am about to purchase some new spade bits, so those Daredevils would be a logical choice for me. I love your content and up to the moment notifications on sales. I actually purchased some Milwaukee cordless nailers from Tool Nut, & thanks to an alert from you guys I saved a whole lot. Thanks! As a contractor I can never have enough screwdriver bit sets. I love the Milwaukee Shockwave and pretty much only is that with my Milwaukee tools. Anything Milwaukee would be great to add to my tools. I love those Bosch bits! My choice for sure. They seem to last forever. Could definitely use more Milwaukee shockwave bit sets. I’m a professional automotive technician and the Shockwave bits would definitely come in handy. Unfortunately it’s the slowest time of the year. I need some new torx bits but money is tight at the moment. I would use the gift card to buy the Shockwave set and couple other tools I need. I love those daredevil bits, and the Milwaukee ones. You can never go wrong with new bits! I’d go with the Diablo blades, as I’m lacking in finish variety at the moment. I get by with sanding for the moment but it does take up more time than it should. I’m stocked up on all three of those accessories at the moment but would love a good box joint cutter for my table saw. I would like to get the Diablo blades. I picked up some when they were on sale last month but I seem to use through them quickly. I’d be getting diablo blades for my new circular saw. I’d go for some countersink drill bits. I don’t have a set; been making due without them for too long. In the last year I’ve become impressed with Bosch’s line of tools and accessories. I would easily purchase the spade bit set. However, the Diablo circular blades are an intriguing item. I have fellow contractors that sing this brands praises and I’ve wanted to try them out. Either way, the $50 gift card would go to best good use. I have the Ridgid 6 1/2″ circular saw, and love it. I work with a lot of reclaimed construction wood, and have lost more than a few teeth on my last couple blades, since a nail or two always seem to hide out. On one blade (brand new), I thought I’d gotten all of the nails out, but on the 2nd cut, hit one that’d been hiding, and lost a tooth. The Demo Demon blade would fit the bill nicely for the kind of work that I typically use this saw for. I’m in the process of building a new house and shop and am doing the bulk of the work myself, so any and all above mentioned tools and many others will be purchased as progress requires, so of course any help in the means of free tools is always appreciated. I would definitely use the gift card for replacement of the Bosch drill bits and new diablo sawzall blades. I first used a Diablo blade 3 weeks ago, best blade ever. 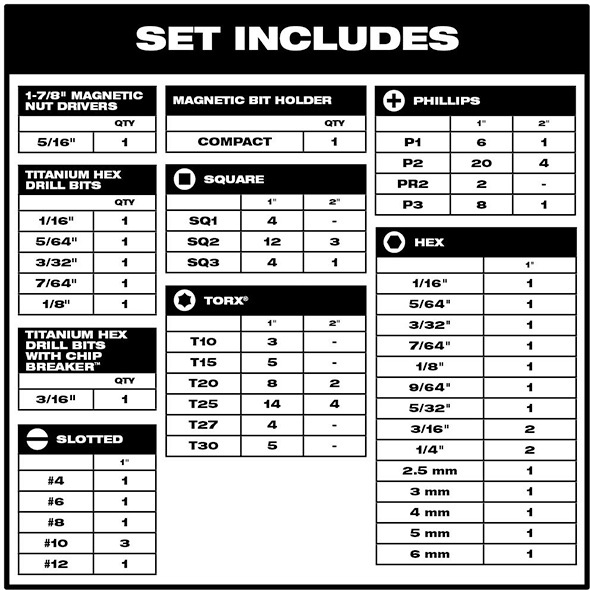 I am considering Shockwave bit set; my assortment of bits needs an update. Besides, I still trying to find perfect bit case (liked Bosch custom case, but it has so much wasted volume,) and Milwaukee looks like a worthy candidate. Could also use Bosch spade bits, especially like their canvas pouch; but I don’t case that much for their name, “Daredevil”. Bosch fixation on naming tools something infernal is unnerving. 50 dollars at home depot! Wow! I would pick up those Milwaukee shockwave bits. Pick me! I an electrician and work for a very small, family based company with only about 4 employees. The owner (my boss and mentor), is a 37 year Master Electrician who has been around the block and has tried and used many different brands of tools and tool kits. He sticks with what works and it has now rubbed off on me! The company, as well as myself, religiously and exclusively use the Bosch Daredevil self feeding bits, Milwaukee power tools (12v and 18v), Milwaukee Shockwave bit kits, Milwaukee hand tools, as well as Diablo circular saw and recipricating saw blades……plain and simple because they work, can take a beating, and they last! We use and sometimes try other brands of tools and tool kits as well, but we will always have the Daredevil self-feeding bits, Milwaukee tools and bit kits, and Diablo blades on our work trucks and individually in our tool bags! Stay with what works! Milwaukee bits break and round off really fast, the drill bits dull really fast too. All my tools are Milwaukee brand so I had to have the matching bits. The extensions and the nut driver bits are great along with the actual tools. Diablo blades are by far the best blades money can buy. The finishing blades I have used on my table saw and miter saw. Excellent! Perfect cuts and long life. You can never have enough blades so I would definitely spend any gift cards on them! I would use a gift card to buy the Bosch Daredevil spade bit set. I’ve used their router bits and have been impressed so far, and I don’t have a larger spade bit kit. I’ve got a small set (maybe six?) made by Irsin but they’re not self feeding. The fit and finish of the Bosch Daredevil bits reminded me of Harbor Freight, but I fell for the price during the holiday season a few years ago. I was very surprised at how well they worked. These are the bits I reach for now. I also like the Diablo blades. Extremely thin and cut superbly. Home Depot had fantastic 2 for 1 deals on them the past few years. I’m not buying any more Milwaukee bits. The drill bits are fine. The screwdriver bits are oversized. I also don’t like their cases. Yes, they look nice. But I have a very difficult time removing and reinserting the bits. I’m in middle of a full home remodel and my miter saw just went out. A Diablo blade to replace the stock blade on whatever saw I decide to buy is a must. I would buy some of the Milwaukee bits. I have been purchasing these exclusively lately, as they seem to last longer than any other bit I have tried. Bosch Spade bits would be a close second, but I just haven’t worn out my first set yet. I’m in the market for some new saw blades, and I’m very happy with the Diablos I’ve used before. I already have a few sets of the Bosch daredevils, so I’ll probably grab another Diablo circular saw blade. Maybe one for the tablesaw. I have already bought all these! I would probably purchase some diablo forstner bits and maybe some more milwaukee drill bits. All the products are great! Ohhh, I definitely need to add more Diablo blades both 71/4” and 10”. Top on my list is Diablo’s Steel Demon. I’ve been making some custom wheel guards for my angle grinder and the Steel Demon would make cutting heavier gauge sheet metal easier. Thank you, Stuart for your generosity. The Bosch Daredevil drill bits because my bits have a propensity of finding nails hiding in the lumber. I’ve got my eye on a Bosch or Diablo Forstner Drill Bit Set. I love the clean holes that these bits bore and I need to replace my worn out Harbor Freight bits. The shockwave phillips bits would be my choice. I use up my regular bits building a deck and this Fall building feral cat houses for volunteers who spade and release them. Hello from SC. I have an old B&D spade bit set that has come in handy once and again, but is old. Those Bosch spade bits look like they could do a better job with that screw tip. Be nice ta hear from ya. Good luck everyone. I would love to try the Milwaukee Shockwave or the Bosch bits. I am slowly but surely upgrading my bits and drivers to impact rated stuff. This would go a long way to finish this endeavor. Love the Diablo blades! Have them on all my saws except my miter. But that could easily be changed! I use all of these brands, and even these exact items. My 19 pc. Bosch set walked off recently because apparently someone needed it more than I did. Luckily I had a 8 pc backup. The Milwaukee bits are on point, and really in the blade category, Diablo can’t be touched. Be more than happy to replenish my stock with a free gift card. Id love to try the shockwave bits. I go through dewalt bits like crazy. The one thing I need like desperately is some new bit sets. Since coming home from deployment a few months ago i’ve been working relentlessly on projects for the wife and kids and keep loosing bits left and right. It’s getting time to buy a new set. The shockwave organizers are the best I have used. I am currently using the shockwave bits to see for myself if they deserve some of the reviews they have received. I picked up a Daredevil spade bit set on special pricing and although I could use a good organizer for transporting them, they work great. I’d buy another shock wave kit for sure! I would use the giftcard to buy my husband the diablo saw blades. I know he loves them! Diablo Finishing Blade for me! Love Diablo products. Would love to get some of those Milwaukee bit sets to replace cheapo set in my every day bag. I’ve been looking at saw blades lately. I was given a cordless as a gift and need to get more than the stock blade. I have seen a number of people recommend Diablo on YouTube as well. Diablo Ultra Finish blade. Always have had good luck and needing a new one to help redo our kitchen floor in water proof laminate flooring. Over the years I’ve acquired a whole bunch of junky tools – often because I buy something I think I need once, find out that I need it more frequently, then kick myself for not buying the better tool right away. Of course, the boss (and my logic) don’t let me buy a duplicate of something I already have unless I have a windfall. This would be a windfall and the old tools would go to a great cause – one of my nephews just had all of his tools stolen while he was working on his house. I ran across toolguyd a few months ago and I love it. It’s helped me find bargains at Home Depot including the Milwaukee impact bits and I already have the awesome Diablo blades so I guess I’d give the Bosch spade bits a try. I also love kctoolco and their wonderful tools, many of which are also sold on the Home Depot website but unfortunately not in my local store. Thanks for the awesome products you show. The gift card would be great too because you also cost me a lot of money! Thanks for the contest ! I would have to say Milwaukee ..maybe hold out for those new impact bits they announced a few days ago I use some Bosch bits currently and despite what it says on the box I don’t believe they are impact rate/seem to be super soft not what I would expect from Bosch. I would be very interested in the diablo blades, I have one on my table saw now and really like it. The Diablo blades would be my pick! Hi Stuart! I would use the Bosch Daredevil spade bits because I have lots of old spade bits from Craftsman, etc. They are barely adequate. They leave holes that are splintery on both sides, not actually round, etc. I do have a few brad-point bits, but they are only available in a few sizes, and being made of carbon steel, are liable to lose their hardening if I push them too hard. Forstner bits would work, but they are slow, expensive, and only available in a few of the larger sizes. Thanks! The image of the twisted bit is very impressive. I have no clue how I can post it here though. I would definitely buy some bits and Bosch space bits. Bits are always wearing down or getting lost. Last summer my buddy and I rebuilt a deck. He had the Milwaukee Torx and square bits we needed. I had bulk purchased noname bits. His outlasted mine and was able to remove screws I couldn’t. The Milwaukee bits are definitely my target. Diablo for sure. Everything they do is top notch in everything they do! I currently use all 3 items. I absolutely love the Bosch daredevil spades. Clean holes with self feed tips. I have that exact set. The Milwaukee bits, are just plain tough. Great bits. Those Diablo blades are the best blades for the money. I only use Diablo in all things that cut, grinders, sawzall, circle saws, Sanders…. Would love to purchase me one of those Ridgid spotlights for work n play, and a $50 card would sure get about 1/2 of that. I could foot the billfor the rest. Really enjoy reading your reviews.. It is hard to narrow it down. These are all quality products that I use everyday. With $50 I could get both the diablo blades in 7 1/4 and the daredevil set. I love the daredevil set. I use it daily and wear through the common sizes often. It would be great to have a back up/replacement set. It is surprising how often the odd sizes come in handy. The selffeed works really well. Milwaukee. We just got a 5 piece set for my husband and the 6 port battery charger. He’s fallen in love with them and wants to continue building his collection. Would love to get the bit sets! I’m a big fan of Milwaukee and can always use more bits! I like your review of the spade blades. I have never used this brand, but am certainly in need of new ones and was looking at new ones last weekend at HD. Thank you for the review. Would love to add more shockwave bits to my small collection and maybe try a 60 tooth Circe blade, I have the 40 currently. I bought the smaller 5 pack I think it was of those spade bits this past Christmas, but haven’t used them yet. I have all three things in this article and use them daily. Would love to get more and try out some of the heavy metal reciprocating saw blades by Diablo I’m a fan of everything else of theirs. Including the quick change holesaw kit I got recently. I would love those Milwaukee Shockwave bits! I LOVE DIABLO BLADES! I am a GC in the Midwest and I run Dewalt 20v system. I would probably try out the spade bits…I currently run a set of tri flute Irwin’s (that work pretty well) but I am always looking for the best quality tool to do the best quality job! Actually I was going to put my hat in on behalf of a ministry I work with here in East Texas (Youth With A Mission). I just reorganized their work trailer and found they didn’t have decent bits or blades. Although, most of them are too young to know the difference between a drill or a driver… I bought them a couple bucket organizers, but they have been building a classroom for foreign exchange students with some blades that look like they’re from the 50s. That $50 gift card would definitely help. Thank you for all your research and posts! You’re my #1 information source for new tools and products. I click through here regularly and throw out my $.02 whether it’s wanted or not! For someone that’s just getting into woodworking and loving it. I would like to try out those Spade bits and the Diablo blades. For I think they would work out great for woodworking. I would buy the Demo Blades by Diablo. We run Diablo blades on most of our saws here at the firehouse and have had nothing but good experiences. The cutting action is smooth, reducing stability issues during an incident. I have a Dewalt 6 1/2” cordless circular saw and have an upcoming project that finishing blade will definitely be useful on. Nice to see. Would love to grab some additional Milwaukee shockwave bits and 6-1/2” diablo circular saw blades. As stated above these are reliable products that produce quality results with each use. Fan of all three brands and own accessories from all three. Most in the market for a new 12″ Diablo Fine Kerf Fine Finish and Ultra Finish Blades for my Bosch 12 In. Dual-Bevel Glide Miter Saw. I always have liked diablo blades. I actually use the diablo metal demon blades on my 7-1/4 ” miter saw to turn it into a chopsaw for angle iron. so that is where it would probably be spent. I have a 12″ Diablo blade on my miter saw currently and love it, so the 6.5″ you showed looks like a great replacement for my worn out stock blade on my circular saw. If there is enough gift card left over to buy that spade bit set, it looks like quite an upgrade from the cheap-o set I have now. I like the Bosch Daredevil bits, especially for the price. The Shockwave bits are terrible both gens, I really prefer the European brands for bits or the Makita Gold bits that are made in Japan…I don’t have a lot of experience with the Makita Gold Chinese bits. The Diablo blades are awesome, they cut way above their pricepoint and tooth count. Milwaukee all the way. Would like to try out the new shockwave matrix you reviewed when they come out that you had another article on. I own all of these items and all are great tools. If anything I’d like to try out the 6 1/2″ fine finish blades – I’m already a fan of the Demo Demon (one is mounted to my 6 1/2″ cordless right now), but haven’t seen any options with a higher tooth count at any of my preferred HD locations. Could be because I haven’t needed to go blade shopping in a few months. Bosch Daredevil have been my go-to spade bits for a few years now – just upgraded to the roll-up Velcro pouch kit as a HD special buy during the holidays. I’ve got plenty of Milwaukee bits, but while I very much like their titanium drill bits, the driving bits (particularly the PH2) have left me less than impressed. I’ve griped about that in other post comment sections, but for impact driving my Milwaukee tools are mostly tipped by DeWalt and Makita bits. While I prefer a drill for drilling, I keep an impact driver in every car and if I get called out to a job while in my sedan or truck instead of the Jeep where most of my tools reside, it’s nice to have a set of drill bits that work in a pinch. I’m in the market for 10″ miter and table saw blades. The stock ones that came with each are worn and it’s about time to change them. Of course they’re going to be Diablos. I would use the Bosch spades and Milwaukee shockwave bits. I have used both items in my remodeling business and specialize in kitchen and bathroom remodeling, as the trend is growing in popularity. Both brands are well developed and dependable. I am constantly using these items and have never been disappointed. I have tried many other brands as replacements but have been disappointed and have always returned to these brands as the lesser brands destroy heads of fasteners, or break causing unnecessary time and product loss. Definitely the Diablo blades. I already have the spsde bit set. I need to upgrade my Spade bits and the Bosch set looks like it can handle alot of use. Id put it towards the milwauke bits as i just had my drill bag stolen so now im in the market for new drill and bits. I would love to win a $50 HD gift card! Could really use one of those Milwaukee bit sets. That bad boy has been on my wishlist for awhile. I’ve heard so many good things about the Shockwave bits, I would try them out. I would buy the spade bits with the pouch. I bought my set and it didn’t come with a pouch so I keep it in the original packaging. I also do like my milwaukee bits too! I am getting ready to start a bathroom remodel in a month and I would use the gift card to buy some Diablo circular saw blades and Sawzall blades for the demo work and for the rebuild. Definitely the Shockwave set. I’m tired of my cheap bits stripping out! Well, I guess I would be in a similar situation as the author of this article. I have used all three, and by far, they are my favorite consumable power tool accessories. My only complaint against the Bosch bits, as a cabinet maker, is that because they are so fast and aggressive, there tends to be a bit of tear out on the finished surface. But in most applications, hands down the best! I have been wanting to try the daredevil spade bits ever Since I wrecked a couple of my irwin ones. This is definately a good opportunity to try them out! Ordered a ryobi 18 volt circular saw and its incredible, plus the ridgid hammer drill is a beast!! I already use them all and love the products. Would buy all 3! 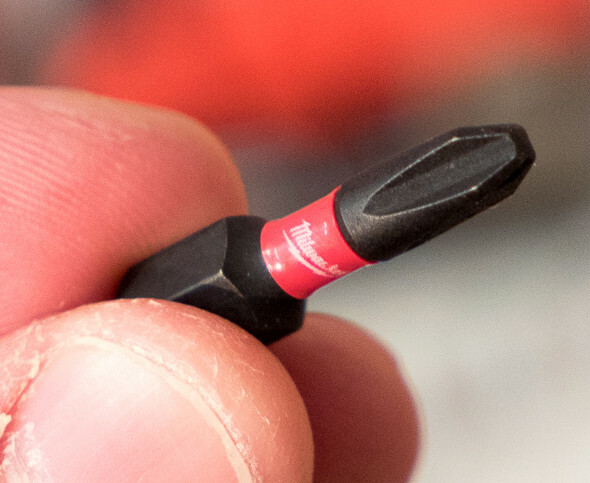 I think bosch impact driver bits are the best, but Milwaukee makes one of the best 1/4” hex dril bits I have used. Makita is good too. I generally buy whats on clearence to fill in the consumed parts, but end up with lots of extra bit cases piling up. I’d buy the Milwaukee impact bits. I bought a set of Bosch impact bits on sale, and they’re not holding up that well, so it’d be nice to have a quality functional set of bits. I’d go with the Diablo blades, since I don’t have an impact driver or much of a use for the spade bits. I can’t tell you how much of a difference it was going from a general-use Avanti blade to a Diablo laminate blade on my miter saw when I was redoing our basement flooring. Because I’m cheap, I’m always tempted to just keep using an inexpensive general purpose blade, but the proper blade just makes things better. The Diablo saw blades seem like a great buy. I have never tried them. Milwaukee Shockwave is my brand of choice. I have purchased three different sets, two I needed and the other was on sale and I couldn’t resist. I have yet to break any of the tips in any of the sets. They are by far the most durable I’ve used. Diablo blades all the way! In the market for replacement s for a table saw and cordless. Like you say could always use more bits as, Milwaukee just makes it all the better. I’d use it to knock down the cost of entering the Milwaukee tooliverse, a table saw, specifically. I’ve needed one too often! I would use my Home Depot gift card to purchase Milwaukee’s shockwave impact bits. As a handyman I use them regularly and love them. They last a long time and you can replace single bits that wear and place in case. A must have for anyone who uses a impact driver. Bosch impact bits or Milwaukee saw blades, can’t go wrong with these. I would likely buy the diablo blades. As a woodworker, I you have to have good finishing blades. I’ve found Diablos to make the cut most of the time. As I enter into the woodworking hobby I would look at some chisels or look at using the gift card to help fund my Makita Track saw purchase. I would use the gift cards to buy a Milwaukee Power saw to build my kids tree house. Power cords only go so far. I would put it towards some decent forstner bits. From what I’ve read I’m leaning toward a Freud carbide set. Bosch dare devils handle my rough boring and Milwaukee’s black oxide or cobalt Red Helix bits cover drill through applications but adding some forstners would add a whole different set of capabilities – clean edges, flat bottoms, angled boring, etc. I’d definitely use the Bosch Daredevil bits. We just framed up the interior walls of a house I’m helping to renovate and will run electrical next. Those look great for cutting holes. Most of my bits are Bosch, always have been. But I don’t have those. And the Diablo blades are fantastic. I have a couple 7 1/4″ blades we used this summer but their sawzall blades are where I think they really shine. I cut down a couple of trees using those this summer. Literal large diameter branches with just an old C3 sawzall and a Diablo blade. I was so easy it wasn’t funny. I only finally pulled out the chainsaw on the trunk. Back to Bosch though, another of their Daredevil bit line I’m convinced everyone should have a set of is their multi-purpose impact bits. The MP500T set. I have two now and use them for darn near everything. You can’t kill them. Whoever does get the giftcard, needs to go into HD and get a set. I would go for a Dewalt bare tool, possible half inch torque driver for the car or the multi tool. Then again, maybe one of the Klein driver sets. I would use the gift card for the Daredevil bits as I have a new drill press and it is hungry for bits! I’d buy another Bosch impact bit set, best bits I’ve ever used! (and I think they look cool haha) I’d also pick up a Bosch drill bit set as I’d like to try them out. I recently bought a Daredevil set myself so I’m good there but after buying a Bosch 12v cordless set last year I’m pretty much sold on anything they make. I would replace my mitersaw blade with a Diablo, I use them on my table saw and love them. I’ve been trying different screwdriver bits recently and have not yet tried the Milwaukee bits. If I won the gift card I would be buying some of those to give a go to. They are less expensive then the German brands I’ve been tryong. Though I really like the Wiha HF bits Ive been using the Milwaukrr bits might be a more coat effective option for the basic tool kits I am putting together for my kids. I would go for the Bosch Daredevil bit set.I have a bunch of old spade bits and a new set with a nice holder for be a big improvement. The Bosch Daredevil bits look a nice upgrade from my current spade bit collection, but the screw driver bit sets would probably get more use. I’m trying to get rid of the non-impact ready stuff in a theatre group I volunteer with so a Milwaukee Shockwave kit and a couple bulk packs would be a great start. I would use the Diablo saw blades. Just finished a basement appartment reno and my blades are good for the trash. I need to stock up before my next project! Wow…they come out of the woodwork when a Free giveaway happens…. …I am not entering nor want to win anything free..
…. 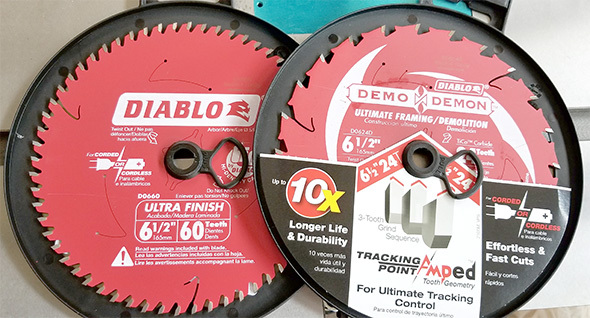 Diablo blades are the best circ saw blades available… especially tracking point, demo demon…we have tried every other brand and nothing is even 50%as good as those. … Milwaukee shockwave, eh..not bad not good.. dewalt flex bits ,not bad…Wiha Terminator and Gedore make the best bits out there..it’s all we use now. Ha. It’s a nice way for all of us to see how many more people are reading this site than regularly posting. Yep, I like the wiha and gedore bits as well. Have you compared them to Felo? Just curious about someone else’s opinion between those. As far as the common brands go in the big box stores, you are right. Diablo makes some good blades. Out in the woodworking and industrial field, it’s a different story. Forrest and other companies hold the title there. The Bosch Daredevil blades are great. Make quick work on some long projects. Could use a nice gift card to buy some more. Thank you Stuart! Nice surprise. I’ve seen the Diablo finish blades at the Depot repeatedly and honestly I could sure use some new blades to try! The Milwaukee bits in their cases are my new favorite bits and cases. Can’t use more. (Yet). Same with the Bosch Daredevils. Great bits. But I have plenty for now. Regardless a nice perk of following Toolguyd! I’d say that these are all good choices though. 👍🏻 Toolguyd rules! All three of these are in the garage, and my top choices in their respective categories already. So, my answer to the question is: I’ll buy whichever one of these needs replacing first! Will probably end up being the Shockwave bits, as they get the most abuse. I have a hand me down Harbor Freight miter saw and I think the blade was used to cut titanium, meteorites, and maybe some UFO parts. It will still cut bread, but only if the crust isn’t too thick. A new Diablo blade would definitely help me out! It would be like putting a new Hellcat engine in a rusted out Gremlin. We’re trying to get out from under this house we’re in which makes a Gremlin look desirable by comparison. I have miles of crown molding that I need to cut, along with hardboard siding. Being able to step up to a Diablo blade… that’d truly be a life saver. The gift card would cover the price of a Milwaukee 49-22-8510 Right Angle Drill Attachment. Barrowed co-worker’s to bore a few holes in tight spaces and it did the job, no problem. That thing is tough! I would use the gift card to purchase a Diablo 12″ finish blade for my miter saw. I have one on the 10″ miter and love it for doing trim. The Diablo blades, no question. I have one on my Hitachi table saw, and can notice the difference with what’s on my miter and circular saws. Makes a big difference on the nicer birch ply I’m making my daughter’s doll house out of. Don’t need any accessories right now, but I might spring for one of those NXT Ridgid vacs. Thanks! The spade bits or the Milwaukee shockwave would come in handy as I’m starting out in my apprenticeship for becoming an electrician. The bits would be handy for rough-ins and the shockwave for finish work. I have been using Dewalt for more than 20 years now and have been EXTREMELY satisfied with their performance and reliability. I now have 8 of their power tools, not to mention their accessories. I’d go for more Bosch spade bits. Those things are amazing, but they – like any other product with a sharp edge – will wear down after enough use and abuse. As I remodel, I can’t have enough of these on hand. I’d buy a couple diablo blades. I only have one back up right now and the one I have on is getting dull fast. I would put it towards Milwaukee Products. I already have and use daily the M18 3/8″ impact and the M12 HackZall. I’d buy a demo blade to cut through all these comments and make me a winner! I stocked up heavily on the bits with the holiday sales, so a new saw blade seems like my best option. For me, it’d be between the Diablo Ultra Finish and the Daredevil bits. I’m in need of a nice 6.5″ blade for use with my cordless Makita. I recently picked up a Kreg Accucut and the sled doesn’t play nice with my old Mag77 Skilsaw, so I’m using my brushless Makita with it. I have Diablo 24T on them now and while they’re great blades, they’re not good for sheet goods other than rough breakdown. I’ve used the Ultra Finish and liked it a lot on my work drive, so seems an obvious choice. As for the bits, I still have the (now Rusty and beat up) Irwin set that I started with 10+ years ago. It needs to be replaced and I need more sizes than it includes. I have a sample Daredevil in 1-1/8″ and love it, but I just haven’t pulled the trigger yet. I bought the Bosch Daredevil bit set. If I won I’d be back to buy a Diablo circular finish saw blade. I would have to go with the spade bits. My set of cheap Irwin bits has been dull for awhile and I keep forgetting to get a new set when I’m at the store. I would get a couple of Diablo 6 1/2″ blades for my new dewalt cordless saw. The Ultrafine and a plywood blade would be nice. Thanks for all you do. Diablo blades. The 6.5 inch do not last long and like most when I find a product Iike I stick with it. The Diablo blades are the only product in the list I use. Those impact bits would be amazing to have for set building. We are teaching new people to use the impact driver and they tend to wreck cheaper bits. Definitely the Spade bits. I moved a year ago and have to build a new shop in the basement. It will require a lot of drilling for electrical, cable, rj45, and water. Those bits keep on working. I would use it toward a Diablo 10 in. blade for the table saw or 12 in. blade for the miter saw. I have not tried these yet but have some projects coming up that I would like to try one on. Daredevil. Looks like a good set for price. I would love to try out some more of the Milwaukee Shockwave bits. I’ve used a couple here and there and been pretty pleased with them, but a couple of these variety sets would be a nice way to get some of the less frequently used bits into my toolbox. I’m about to work on some furniture for around the house and would probably use the Diablo circular saw blades. Need to get something a little smoother than the framing blades I have. I need a new finishing blade for my miter saw and will be getting a diablo blade, as I have been quite pleased with their quality. I too also like the bosch daredevil bits, they’re great! The Milwaukee Shockwave impact screwdriver bit sets are fantastic. These bits have become my go to for drilling and driving. I would probably get the impact bit set, my current set is pretty sparse. I need a nicer finish blade for my 10 inch miter. Thanks for the giveaway. Unfortunately, I do not currently have a need for any of the items on the list… Have enough on hand at the moment. Equally unfortunate, there is no local Home Depot in my neighborhood. Lowes and Menards, yes. HD, nope. Nearest one is thirty minutes plus drive to get to. I have always found it curious that Home Depot has not built a store here, but I am sure they have their reasons. I would probably split the gift card between Diablo blades and Milwaukee bit set. I have a few summer projects planned and will need both. I am going to buy Diablo blades for my Ryobi 18v tools. I have heard nothing but good comments from everyone about them. I don’t have a need for spade bits at the moment but when the time comes maybe a good set of daredevil bits will be the best to get. I wanted the Milwaukee bit kit for Christmas, but no one in my family took the hint (even an included photo) and then the week of Christmas they ran out, so I could buy them after! I purchased the Bosch DareDevils from Home Depot last month. They are great, so I don’t need to buy them again for a while. I’ll definitely buy the Diablo blades. I know they are great because I used them all the time. I’d put them on my Makita 18V saw. I’ve always used the framing blade, but I’d love to try out the fine finish 6 1/2″ blade. Thanks for the giveaway! I would use the gift card for the Diablo circular saw blades since I been using the same circular saw blades for a long time usually spending my money on table saw blades instead. First – I was given a 12v DeWalt drill a few years back.. needless to say it was a welcome replacement to my cheap Black & Decker from Walmart. As a result of a beautiful friendship ensued. I have since become rather invested in DeWalt power tools, and I’ve loved every minute of it. (Except the weird chuck thing.. where it fails to latch and clicks its way to the end of its travel. Who can relate with me here?) You could say I’ve ben on the road to ‘die hard fan’ status. I’ve always heard great thing about Milwaukee though, and it seems in some discussions as though Milwaukee vs DeWalt is comparable to 2% milk vs 1% milk, not in any respective correlation. I want to take a walk on the wild side and experience what I may or may not have been missing out on. Well they may be just the bits and not the tool itself it’ll offer decent insight, plus I have a friend with a Milwaukee maybe I’ll be able to borrow it. I would replace my tablesaw blade with a diablo for the custom moulding project im working on as part of my basement remodel. I’d have to go with the bit sets, i’m good for blades and love the Milwaukee setup. I use all three products and have nothing but good things to say about them. If I were given a card, it’s probably time to pick up some new diablo blades. Can always use more bits, they tend to get left here and there or loaned out and never returned. After Christmas I purchased one of the Ryobi brushless tool kits so I could get a grinder and jigsaw for fairly cheap. However, it did come with their brushless Circular saw that I surprisingly pleased with. I would love to see what a Diablo blade would do for its performance. I would really love to try those new shockwave matrix bits. I also could get good use out of that demo circular saw blade. Keep up the good work. I love the Diablo blades for my saws and would probably pick up another couple for spares when my current ones wear out. I would also add some of the Milwaukee Shockwave bits to the mix after trying a few on Black Friday, I’ve been very pleased with how they hold up. I really need a new Cordless Drill. I would probably go for a brushless Milwaukee unit. I would love to pick up a new Diablo table saw blade. I haven’t used the Milwaukee impact bits but look forward to trying them out in the future as well. All my cordless tools are Dewalt and Ryobi but all my accessories are Milwaukee accessories. This summer I am going to install a metal roof on my home. I bought a new impact wrench for the fastening of the panels and some metal shears for the cutting. I initially was going to buy a Diablo metal cutting blade, but the panel manufacturer recommended the shears. The Milwaukee Shockwave Impact Screwdriver Bits would have all of the tools I would need for the fastening of the panels to my roof, as well as the flashings and trims. Il y a de ces acteurs que, tout ce qu’ils font de ces films excellents! Milwaukee est un peu comme cela, tout ce qu’ils font est excellent! Et ces ensembles d’embouts de tournevis à percussion Milwaukee Shockwave sont ainsi. Le seul petit reproche serait que ces embouts sont parfois difficiles à insérer dans le boîtier. I would love the Diablo saw blades. It would be nice to win the Milwaukee bits.